"Standard & Poor's Equity Research downgraded shares of XM Satellite Radio to "sell" from "hold" and cut the price target to $8 from $12, citing the company's recently reduced guidance. Last week, XM trimmed its 2006 subscriber additions estimate to 2.6 million from 3.1 million, expecting to now reach a total of 8.5 million subscribers by year end. The company reaffirmed its expectations for positive free cash flow by the fourth quarter of 2006 and for full 2007. "We see investor confidence undermined by reduction in XM's estimate[s]," wrote analyst Tuna Amobi in a research note Wednesday. Amobi said he is now more wary of new disclosure on retail shipment disruptions arising from the FCC's finding of non-compliance with emission limits for popular plug-and-plays SkyFi2, and Audiovox Xpress. The analyst also cited a pending shareholder suit and copyright suit against XM's Inno portable as reasons for the downgrade. Meanwhile, Amobi reiterated a "strong buy" rating and $8 price target on shares of Sirius Satellite Radio. As XM trimmed its outlook amid mounting regulatory issues, Sirius reaffirmed its 2006 target of over 2.8 million net subscriber additions to over 6.2 million by the end of 2006. "While satellite radio seems to us vulnerable to investor sentiment, we see Sirius' shares unfairly affected by recent woes of rival XM Satellite Radio," he said. In addition, Amobi sees senior management's confidence in the underlying business further demonstrated by chief executive officer Mel Karmazin's recent addition of 1 million Sirius shares to his 5-million holding." SIRIUS Satellite Radio(Nasdaq: SIRI) today announced that David Frear, its Executive Vice President and Chief Financial Officer, is expected to present at the Friedman BillingsRamsey Growth Conference in New York on Thursday, June 1, 2006 at 8:15 am ET. Sirius satellites radio's David Frear spoke at the Bernstein Conference today, and covered a few topics that people have been watching for. Video and additional bandwidth are basically tied at the hip. Sirius has developed a hierarchical modulation, which they now refer to as (thankfully) "Overlay Modulation". Overlay Modulation allows Sirius to in effect increase the use of their current bandwidth by 25%. It is this additional capacity that will allow Sirius to offer three live video channels. They will also have some capacity to spare, enabling them to tweak other content as opportunity arises. Frear indicated that these services may be available as early as the end of the year. Satellite Standard Group is keeping you up to speed with satellite radio events. Today, David Frear of Sirius Satellite Radio spoke at Bernstein Conference. Most of the presentation was as expected, but there was some information regarding FCC compliance. 1. Some manufacturers of Sirius radios did receive a letter from the FCC regarding FM modulators. 2. Those letters, along with the test data were forwarded to Sirius engineers, and then on to the FCC. 3. Some radios were found to be out of compliance. It appears that whatever the issue was, that it has been addressed. Contrary to the assertion made by Johnathan Jacoby of Banc of America, there is no lingering issue between Sirius and the FCC regarding FM modulation. Supply of radios to retailers should not be impacted. Has Cramer Turned the Corner on SIRI? "He (Cramer) said that it makes sense that Sirius Satellite Radio (SIRI:Nasdaq - news - research - Cramer's Take) is beating out XM Satellite Radio (XMSR:Nasdaq - news - research - Cramer's Take), given the fact that XM dramatically missed its most recent quarterly estimates. Plus, Sirius is run by Mel Karmazin, who Cramer called "money in the bank." Now that the stock is near $4, he said that he is more bullish on it, but that he would ring the register once it hit $5 or $6." Those that have followed satellite Radio for any length of time know very well that Sirius and XM have traditionally traded in very similar patterns. As the companies grew, good news from either satellite radio provider shined nicely on the other company as well. The same became true for bad news. Traders could take advantage of this process, and catch dips and peaks with the confidence that the news for either company seemed to have a virtual duplicate impact on the other. The fact that these companies exist in a virtual duopoly helped to make satellite radio a sector play rather than a simple investment into a single equity. Recent events have potentially caused a separation in the trading behavior of these stocks.....At least to a certain extent. Those that actively trade Sirius and XM may bell well served to keep their eyes on the individual companies now more than ever. While there are aspects in the news that impact both companies, there are also events that are company specific. As the catalysts that move these stocks switch from impressive subscriber metrics to impressive financial metrics, the separation should become more pronounced and clear. To a certain extent, this is the first time where choosing a horse to ride with is more important than simply being in the race. Many people, myself included, hold positions in both companies. Now more than ever, consideration as to where you as an investor will be placing your bets seems to matter more. The coming months will be very interesting for satellite radio. Investors should look at and consider several factors involving these equities in making an investment decision. Is the sector right for you? If so, which equity seems to offer the best scenario to meet your goals? Do a lot of research, and work up your conclusions. It is your money, so become as aware as you can. SIRIUS Satellite Radio(Nasdaq: SIRI) today announced that David Frear, its Executive Vice Presidentand Chief Financial Officer, is expected to present at the Bernstein Strategic Decisions Conference in New York on Wednesday, May 31, 2006 at 3.00 pm ET. A live audio webcast of the presentation will be available via theInvestor Relations section of the company's website www.sirius.com on Wednesday,May 31, 2006, at 3.00 pm ET. XM Satellite Radio(Nasdaq: XMSR) today announced that Gary Parsons, XM Chairman of the Board, is scheduled to make a company presentation and participate in a question and answer session at the Sanford C. Bernstein & Co. Strategic DecisionsConference in New York, N.Y., Wednesday, May 31, 2006, at 4:00 pm ET. A live audio webcast of the presentation will be available via theInvestor Relations section of the company's website http://www.xmradio.com/ on Wednesday, May 31, 2006, at 4:00 pm ET. Bear Stearns comments on XM's 8K filing last night where it disclosed a plan to bring all its devices into compliance with FCC regulations on FM modulators. Among the steps XM is taking is to request manufacturers to stop shipping radios and accessories that include FM modulators. Given the average inventory carried by retailers is about 30 days, near term sales are unlikely to be impacted; however, any significant delays could have a material impact on the financials. While the 8K improves visibility into the issue, the several questions that remain unanswered likely will continue to impact valuations in the near-to-mid term. A "read" of the Audiovox Xpress user manual suggests infringement may be material. The firm believes that management's credibility has been questioned since Q4, when marketing dollars were promised to be curtailed against a strong Howard Stern. Since then, the momentum has been negative for XM, dissuading growth investors. With a lack of near term valuation metrics for value investors to step in, the firm believes an "investor chasm " has been created in the stock, allowing for more downside. The firm underscores that it does not believe this is an industry phenomenon and in fact believes a de-coupling of Sirius Radio (SIRI) from XM, as XM's previous premium (confidence in management) has been eroded. RoadLoans(R) customers can now experience the freedom of listening choice that 6 million subscribers enjoy as the company teams with the nation's number one satellite radio provider, XM Satellite Radio. Starting today, customers who get an auto loan with RoadLoans will receive a free XM Satellite Radio. Since it began in 2000, RoadLoans, a leading Internet direct-to-consumer auto lender, has delivered innovative auto financing to customers, even for those with less than perfect credit. The company continues this innovation as it combines innovative financing products with great customer service, and now the benefit of America's leading satellite entertainment, XM Satellite Radio. Now through Aug. 1, 2006, any customer who gets a loan through RoadLoans -- whether for a new or used automobile or the refinancing of an existing auto loan -- will receive an XM Satellite radio delivering 160 digital channels and the most commercial-free music available today when customer signs up for six months of programming through XM. The radio, along with activation fees are complements of RoadLoans." WASHINGTON (MarketWatch) -- XM Satellite Radio Holdings Inc. (XMSR) said Tuesday that it is working to bring devices designed to work with the XM system into compliance with the Federal Communications Commission's requirements. In April, as reported, the company received a letter from the commission saying it had tested the Delphi XM SKYFi2 radio and determined that its FM modulator wireless transmitter "isn't in compliance with permissible emission limits." In addition, Audiovox Corp. (VOXX), manufacturer of the Audiovox Xpress, a radio designed to work with the XM system, received a similar letter from the FCC and has suspended shipments of that product. The FCC in the letter cited Audiovox for non-compliant operating bandwidth specifications as well as related emission limits. In a filing with the Securities and Exchange Commission Tuesday, XM Satellite said that it is "implementing a series of actions involving various radios to bring them into compliance, including requesting our manufacturers to suspend shipments to retail of radios or accessories that may require changes to operating or installation instructions, or modifications to software or hardware." XM Satellite also said it will seek new equipment authorizations where appropriate, and it expects to provide additional information to the FCC shortly, including test results for several modified XM radios. The company also said it is "working to limit the interruption in supply of certain models of XM radios to retailers." "We can provide no assurances at this time that our actions will be deemed sufficient by the FCC, or that other remedies that may be required by the FCC will not have a material impact on our consolidated results of operations or financial position," it added. Shares of the company closed Tuesday at $14.24 each. The quick eyes over at Sirius Backstage caught this. Sirius seems to be getting ready for "The Stern effect Phase 3" as are we here at SSG. "Today SIRIUS unveiled a new capability that allows multiple-receiver subscribers to have multiple online streaming accounts. Subscribers can enable multiple streaming access by visiting the Manage Your Account section on the SIRIUS homepage. The option will only be available to subs with more than one active radio." Sirius has previously stated that they will be streaming Howard Stern On-line before Fathers Day. With Father's Day less than 3 weeks away, we are bound to get an announcement soon, and with that announcement "The Stern effect Phase 3" will begin. "A gargantuan lawsuit that commanded business and entertainment headlines just months ago was settled rather unceremoniously last week, when CBS (NYSE: CBS) agreed to drop its case against radio host Howard Stern. The agreement's terms lend some credence to claims from Stern and many legal experts that CBS's legal attack had little foundation. The deal will give more than bragging rights to Stern, though, since it involves an exchange of assets that seems likely to strengthen the content of Stern's new employer, Sirius Satellite Radio (Nasdaq: SIRI). " "...More importantly, Stern will gain control over a valuable asset from CBS in exchange for the payments: As part of the deal, CBS will surrender its rights to 20 years of master tapes of Stern's CBS radio shows. It's not clear how these tapes will be used, but since Sirius' $2 million contribution goes toward paying for these rights, there's a good chance that the material will be integrated in some way into Stern's programming at the satellite radio company. If so, this old content would provide Sirius with a rather strong selling point for former Stern listeners who haven't yet signed up for satellite service, since Stern surely would enrich his current show by the selective use of old material. But with so much content and a lot of airtime at his disposal, Stern probably would do more than that. He could, say, dedicate a time slot to replaying old classics, or have a call-in request show for past bits. That could provide Sirius with a whole new sales pitch -- Lots more Stern for the same (at least for now) price. With this move, Sirius is only strengthening its edge over competitors such as terrestrial radio and rival XM Satellite Radio (Nasdaq: XMSR)." Sirius had announced that the 20 year catalog of Howard Stern materials will be available to them for the Howard Stern channels through the duration of his contract with Sirius. However, their 8-K, released today, states that this 2 million dollars is the ONLY payment under the settlement agreement that they will be paying out. Whether Stern did or did not have to pay out anything himself is unknown due to a seal on the settlement agreement. Section 8.01 - Other Events. The lawsuit brought by CBS Radio Inc. against us along with Howard Stern and others referenced in Item 3 of our 2005 Annual Report on Form 10-K has been settled. As part of the settlement, CBS Radio is conveying its rights in the recordings of the Howard Stern Show that aired on CBS Radio from 1985 through 2005. We will have the right to use those recordings as part of our Howard Stern channels through December 2010. We are making a total payment of $2 million to CBS Radio. This is the only payment we will make under the settlement agreement. LONDON (MarketWatch) -- Lehman Brothers upgraded Sirius Satellite Radio (SIRI) to overweight from equal weight, saying that while the stock has traded down in sympathy with peer XM Satellite Radio Holdings Inc (XMSR), it doesn't believe the move was justified. The broker told clients that recent negative headlines were specific to XM and shouldn't have affected the sector. Lehman said it would be aggressive buyers of both satellite radio stocks following the recent weakness. By Spencer E. Ante, with Cliff Edwards in San Mateo, Calif. The satellite-radio war can't be won by Howard Stern alone. So shortly after signing the shock jock to a $500 million contract in 2004, Sirius Satellite Radio called on a small Portland (Ore.) consulting firm to envision a device that would help it catch up with bigger rival XM Satellite Radio Holdings. (XM ) Ziba Design dispatched a team of social scientists, designers, and ethnographers on a road trip to Nashville and Boston. For four weeks they shadowed 45 people, studying how they listen to music, watch TV, and even peruse gossip magazines. Their conclusion: A portable satellite-radio player that was easy to use and load with music for later playback could be a killer app in the competition against XM. Last November, Sirius began selling the Sirius S50, a device the size of a slim cigarette pack that stores up to 50 hours of digital music and commentary. It features a color screen and handy buttons that let you easily pick your favorite song to listen to. Slip it into a docking station and it automatically gathers and refreshes programming from your favorite Sirius channels. Techies praised the device, declaring it better than XM's competing player, the MyFi, launched in October, 2004. The S50 became one of the holiday season's hottest sellers. Sirius says it has helped the company sign up more subscribers than XM has since last fall. "[Ziba's] research capabilities and innovative approach to design concepts were most impressive," says Sirius President James E. Meyer." Third Stern Channel on Sirius? There is speculation that Sirius will launch a third Howard Stern Channel, "Stern Classic", now that Stern has the rights to his old tapes. The channel would be "un-bleeped" according to sources. Sirius, as part of the settlement has access to the material for the duration of Sterns contract with Sirius at no additional charge. The profit potential of this third channel is substantial. The programming cost Sirius satellite radio $2,000,000 for what amounts to over 4 years of use. Advertisers that are already spending money with Sirius will be very likely to take out ads on the classic channels as well. Further, those with S50's and the as yet to be released "Belagio" unit will be very active recording these old bits of Stern history. There is already a "pent-up demand" for the content, and programming the channel would be very easy. This third channel can ad to the bottom line immediately. CALL out the strippers and bring in the lesbians, Howard Stern has settled his $500 million lawsuit with CBS Radio and insiders say he's making out like a bandit. CBS says Stern's new employer, Sirius Satellite Radio, will pay $2 million to keep 20 years worth of Stern-show tapes it claimed he took without permission when he noisily bolted terrestrial radio last year, The Post's John Mainelli reports. And with the old tapes now in the shaggy-haired jock's sweaty palms, there's talk of a "Classic Howard Stern" station that would air his past K-Rock shows unbleeped. Stern was said to be ecstatic about the settlement yesterday - a 180-degree turnaround from when the bizarre suit was filed earlier this year." 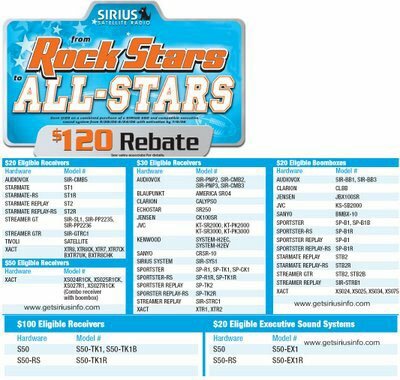 For the first time Sirius is offering rebates on "boom-boxes" as well as receivers (click image to enlarge). Of special note is the substantial rebate on the S50. It would appear that consumers can get an S50 for about $149.00 after rebate now. It would appear that Sirius is making some room for new hardware, while at the same time giving popular receivers an attractive price point for the Fathers Day shopping season. Last year June was Sirius' third best month at retail (Behind December and November), and it appears that Sirius' activation center will be busy again this June. The rebate starts this Sunday. Sirius essentially paid $2 million for the rights to use the recordings for the duration of Howard's contract. Think of the advertising possibilities. What a deal! And, now no legal overhang! AP got it right when they described the settlement as "Howard Stern regains rights of 'classic' episodes"
Shock jock Howard Stern regained control of the master tapes from the last 20 years of his terrestrial radio program in a Friday settlement of the contentious lawsuit brought by his former bosses at CBS Radio. Stern's new employer, Sirius Satellite Radio Inc., agreed to pay $2 million to CBS Radio, CBS Corp.'s large radio subsidiary, in return for the rights to the classic recordings, according to a statement released by both sides. " As part of the settlement, CBS Radio will receive payments relating to the conveyance of its rights in the recordings of 'The Howard Stern Show,'" the statement read. "Sirius, for its part, will make a total payment of $2 million related to this conveyance." The remaining details of the settlement remained confidential, according to the statement." Something Happening With XM Hardware? There are reports that XM hardware is being pulled from shelves at XM kiosks. We are checking with other retailers to confirm. A check with XM's on line radio store shows ALL PRODUCTS out of stock. Speculation that this involves FCC compliance is swirling. Satellite Standard Group will update when we confirm more information. Again, there is a lot of speculation and rumor surrounding this issue. Satellite Standard Group is pleased to bring you what we understand as the details surrounding the settlement of the CBS suit regarding the old tapes. 2. Stern now has full ownership of the tapes. 3. Sirius gets use of the tapes with no additional compensation to stern for the length of the current Stern deal. In the opinion of Satellite Standard Group, this gives Sirius the ability to create a third Howard Stern channel full of "Classic Howard Stern". The channel would likely be very successful, and would bring in well over Sirius' $2,000,000 in terms of advertising revenue. SSG advises investors to watch the SEC filings (8K's) of both Sirius and CBS Radio on Tuesday. Those filings will outline the official information that investors will be made aware of. Satellite Standard Group had an article read on the Howard Stern Show today. The article titled "The Stern Effect Phase 2" was read by Howard Stern in response to whether or not Howard was bringing subscribers to Sirius Satellite Radio. Well, there can be little doubt of Sterns impact at Sirius given the large influx of subscribers in the first quarter, and year end guidance being raised by Sirius from 6,000,000 to 6,200,000 while counterpart XM satellite radio has trimmed 500,000 subscribers from their year end guidance. Earlier this year Satellite Standard Group had an article titled "The Stern Effect" posted to the front page of Howards website. The article about "The Stern Effect Phase 2" has now made it to the air. We here at Satellite Standard Group are looking forward to writing "The Stern Effect Phase 3" when the Howard Stern Show becomes available over the internet in the coming weeks. "The biggest loser in my portfolio thus far has been my selection of Sirius Satellite Radio (SIRI), but the tide may be turning in a big way. Yesterday’s announcement by XM Satellite Radio Holdings (XMSR) of reduced guidance followed by Sirius’ reiterating its own guidance was stunning news in my opinion, and should trigger a much-awaited move by institutional investors away from XM Satellite and into Sirius. It’s about time. For whatever reason -- anger, fear, or simply poor analysis -- the larger investors have decided that XM was the better play. My good friend at Bank of America has long been a proponent of XM and a basher of Sirius. I wonder what he will say now that XM is expecting 500,000 fewer subscriptions. That’s a big miss in this relatively infant business of satellite radio. Frankly, it was a stunning announcement and should get Mr. B-of-A analyst over to the winning side. I always believed Sirius to be the better play, but I did not expect them to so thoroughly crush XM. And make no mistake, Sirius is thoroughly crushing the competition here. Consumers have a choice and the winner of late is Sirius by a wide margin. Merger is a must I’m hopeful that the news of the day may spur some much-needed discussions between XM and Sirius. There is absolutely no reason why these two companies should not be merged together into one entity. 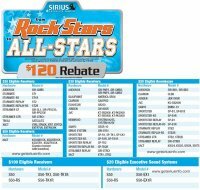 Sirius could really use XM’s auto deals and XM could really use Sirius’ content. Both could use higher prices that would follow in a merger. Yes, the regulatory agencies would be skeptical of a combined satellite entity, but they should allow a deal to proceed. The real competition is between satellite and terrestrial, thus there are no monopoly or antitrust issues to worry about.Competition in the space now creates more challenges than benefits. With prohibitive costs to entry, government should support a monopoly as the higher prices charged offset start-up costs. As it stands now, because there are two entities, the price of services is artificially lower than what it should be, on an economic basis. Oh, sure, one could argue that there is no consumer need for satellite radio and that such a service is a luxury, but is that really the case? I would argue, no. In a world economy, we need to have access to knowledge and information to stay one step ahead of the competition.I could and will make the case that satellite radio serves an educational need in this country. By having more access to content, as compared to terrestrial radio, the listener is improving his life. Even the ability to better unwind from the challenges of any given workday makes satellite a compelling need versus a service. So management of Sirius and XM, if you are listening, I hope you do us all a favor and start discussing the possibility of a merger. The numbers for one satellite entity would be quite compelling from an investor standpoint.In the mean time, as a Sirius advocate, I will enjoy the fact that my horse is winning the race. I expect Sirius to hit 6.5 million subscribers by the end of they year above what is currently expected. The selling in Sirius has been completely excessive and nonsensical. This horse will be a fine stud in the long term. I would use this opportunity to buy more shares at these bargain-basement prices. Do so now, before these institutional geniuses figure out the story here. As always, they are a day late. No worries, though, as we should welcome their presence and the higher price it will eventually reap. For those interested keeping up to date on things, may I suggest a subscription to my newsletter service, The Rational Investor. You can join by visiting www.therationalinvestor.com. Please feel free to e-mail me at jdlugosch@hotmail.com with any questions about my approach. If you are interested in receiving a prospectus for The Rational Investor Fund, please e-mail us a request at info@therationalinvestor.net." The company announced today that it was revising its yearend subscribercount target to 8.5 millionfrom the former 9.0 million. While this still indicates that another 2 million net new subscribers will be added in the final three quarters of the year, the reduced target suggests the pace of subscriber addition in the balance of this year will lag that of the same period lastyear. A slowed rate of growth can call into questions the aggregate targets we have maintained through the end of this decade. This is the latest in a string of bad news for XMSR and certainly the most serious, in our view. In recent months XM has been plagued with a director's resignation, challenges by both the FTC and FCC, sharply higher than expected SAC costs it has been attempting to curtail, a conflict with theRIAA over performance rights related to its new receiver hardware, and now this. While the other issues were less significant on an individual basis, they collectively weighed down the stock. The subscriber count issue, however, goes beyond a nuisance factor and calls for a closer look on various assumptions. Reflecting this more serious news, we are cutting our opinion on XMSR toMARKET PERFORM from the previous OUTPERFORM. SIRI: Outperform - The firm noted they continue its OUTPERFORM recommendation. While the stock has traded down and remained characteristically volatile, we continue our positive view on the common and view this stock as the current preferred choice for those interested in participating in this industry segment. Cowen(theflyonthewall.com 05/26 07:17:41) views the recent selling in XMSR & SIRI as overdone and views valuations as compelling based on 2008 metrics and expected visibility. The firm says shares of both companies are experiencing shareholder rotation as momentum investors exit but expects value sensitive investors to return. XM Satellite-XMSR guidance could still be aggressive, target lowered-Buy@STFL(theflyonthewall.com 05/26 07:54:40) - Stifel, Nicolaus & Co. believes the reasons for XM's lower retail subs guidance could be due to a slowdown in marketing spending, rough YoY comps, Howard Stern and gas prices. They believe 2010 guidance of 20M subscribers looks to be too aggressive by 2M and has lowered their target to $20 from$25. The firm also believes the valuation gap to Sirius Satellite Radio(SIRI) should tighten because XMSR's enterprise value has been too "out of wack" in relation to SIRI. They feel either XM needs to come up or SIRI needs to go down. Sirius Satellite-SIRI target lowered, long-term guidance could be at(theflyonthewall.com 05/26 07:29:03)risk-Buy@STFL - While Q2 looks to be "OK" for Sirius after management reiterated guidance this week, Stifel, Nicolaus & Co. believes long-term guidance could be at risk if the company faces slowing gross retail adds. The firm has lowered their target to $6 from $7.50 and will maintain Buy onthe belief that SIRI will get closer to its long-term guidance than the Street currently expects. XM Satellite Radio Holdings "buy," target price reducedThursday, May 25, 2006 9:28:19 AM ETMorgan Joseph & CoNEW YORK, May 25 (newratings.com) - Analysts at Morgan Joseph maintain their "buy" rating on XM Satellite Radio Holdings Inc (XMSR.NAS), while reducing their estimates for the company. The target price has been reduced from $40 to $24.In a research note published this morning, the analysts mention that the company has reduced its subscriber growth for 2006 from nine million to 8.5 million, marginally short of the estimates. XM Satellite Radio Holdings’ performance is expected to improve in 2007 due to OEM ramp-up, the analysts say. Although the company has projected its subscriber revenue guidance for the year significantly short of the estimates, it has retained its cash flow guidance, Morgan Joseph adds. The EPS estimates for 2006 and 2007 have reduced from -$2.01 to -$2.16 and from -$0.76 to -$0.91, respectively. Americans have always had a love affair with low prices. What's not to like about grabbing a cheeseburger for a dollar at McDonald's (MCD ), or a bottle of soda for 50 cents at Wal-Mart (WMT )? In the investing world, there's a similar psychological appeal to stocks that trade for less than $10 a share. A modest share price has advantages. The standard unit for stock transactions is a round lot, or 100 shares. Any order that can't be broken up into round lots is called an odd lot, and can lead to extra fees. Still, savvy investors know that low-priced stocks aren't necessarily cheap. That's why investors and analysts spend so much time studying measurements to assess a stock's valuation. The old saw -- some things are cheap for a reason -- always holds true. Of course, the whole point of bargain-hunting is finding diamonds in the rough. This week's Five for the Money looks at stocks with attractive prospects and share prices below $10. Keep in mind, though, that these stocks carry higher risk than other, more established names. So even though the pricetag may tempt you, think carefully before putting any of them in your cart. 1. Listen to the stars.Howard Stern for $100 million a year? That probably doesn't sound like a steal. But Sirius Satellite Radio (SIRI ), the radio operator paying the shock-jock's salary, could be a good buy for just a few bucks, some analysts say. Shares in the New York-based company were trading at $4.23 on May 25. Sirius shares hit a 52-week low of $3.60 on May 24 after larger rival XM Satellite Radio (XMSR ) cut its forecasts for full-year subscriber growth (to 8.5 million subscribers from 9 million) and revenue amid soft retail sales of satellite radios in the second quarter. Sirius reiterated its outlook for more than 6.2 million subscribers by the end of 2006, and says it may book its first quarter of positive cash flow as early as the fourth quarter. Both stocks have skidded more than 40% this year, following double-digit percentage losses in 2005. Sirius' depressed price means investors can now tune in for cheap, some analysts say. In a Mar. 8 report, Standard & Poor's analyst Tuna Amobi projected Sirius's subscriber rolls, which at last count was around 3.3 million, will swell to 9.8 million by the end of 2007, helped by Stern's arrival in January, 2006. "We expect a significant rampup in the automotive channel over the next two years, and see retail sales increasingly benefiting from new portable products," wrote Amobi, who has a strong buy recommendation on the stock. Of the 33 analysts covering Sirius, 14 say buy, only one says sell, and the rest fall somewhere in the middle, according to data from S&P Equity Research. " This is not something that Satellite Standard Group would normally write, but after seeing what Jacoby has done over the years, we felt that his actions deserved a response. It is no secret that Banc of Americas analyst Jonathan Jacoby is a fan of XM Satellite Radio. It is also no secret that Banc of America has substantial capital invested in XM (they also have invested in SIRI, but to a much lesser extent). Jacoby has been very persistent in his outlook for XM, and at times seems to take "pot shots" at Sirius in his reports. Investors in Sirius have always noted that as things began to climb, you could count on Jacoby to issue something to stem the rise of Sirius. Earlier this year there were those that heralded Jacoby's call on Sirius at $4.50. What those investors forgot was that Jacoby has always tied his Sirius target of $4.50 to an XM price of $30. We are all well aware that XM is not at $30. Jacoby still seems to feel that "relative valuation" is the main component of Sirius, and remains his reason for a neutral rating on Sirius, and a buy rating on XM. It would appear that Jacoby feels that Sirius is properly valued at current levels. Jacoby is quoted as saying to investors today that, he has, "become more positive on Sirius given its absolute valuation vs. our $5 price target, but we're maintaining our "Neutral" rating due to an expensive relative valuation and our belief is that management needs to demonstrate more rational competitive behavior." WHAT DID HE SAY????? Sirius management needs to demonstrate more rational competitive behavior????? Did Jacoby miss which satellite radio company spent large amounts of money in Q4 2005 and again in Q1 2006? Does Jacoby feel that a PR by XM citing that the entire sector is weak is rational competitive behavior? Does Jacoby feel that XM's comments in light of the Volkswagen/Audi deal were rational competitive behavior? Does Jacoby feel that consumer complaints against XM to the point of an FTC investigation are rational competitive behavior? Has Jacoby missed the litigation filed by 14 law firms charging that XM overspent? Did Jacoby miss the resignation of Board Member Roberts, and his reasons for leaving? It was only a few weeks ago that Jacoby was touting that XM had an advantage because of the WCS spectrum. Interestingly, he nas not mentioned it lately. Most other analysts were trying to obtain information from XM regarding the spectrum so that they could work on their projections. Meanwhile, Jacoby called the spectrum a good thing for XM without understanding the build-out costs. Now, XM no longer has the spectrum, and has lowered guidance, and Jacoby still feels that XM is a better buy, and that XM should be at $25.00 when Sirius is at $5.00. SSG feels that both Sirius and XM are undervalued. We feel that both companies are oversold. We feel that both companies can do well. We feel that Jacoby needs to look at things a little deeper, and look at what becoming Cash Flow Break Even first means to Sirius. In the opinion of SSG the IRRATIONAL COMPETITIVE BEHAVIOR is being exhibited by Banc of Americas Jonathan Jacoby, who doesn't waste any chance to take a shot at Sirius. Martha Stewart, who has her own channel on Sirius satellite radio, and many other ventures is adding yet another feather to her cap. Martha is planning on launching a social networking site for women. The idea will surely bring her yet another medium to give her brand more awareness. OPCO notes (theflyonthewall.com 05/25 10:11:55) that while XMSR lowered their guidance, SIRI maintained theirs. They wouldnot chase shares of XMSR, but they believe yesterday's sell-off is overdone. Satellite Radio - Are XM and Sirius Still Tied at the Hip? For years Sirius and XM have traded in very similar patterns. This is very evident by looking at any long term chart comparing the two. This sector trading behavior has at various times been very helpful to one equity or the other, and at other times been very detrimental. To date, there has been no real catalyst that has been able to create a separation that would allow for these stocks to trade on a more individual basis rather than as a sector. Hardware has not broken the tie, nor have subscriber numbers. Satellite Standard Group feels that this sector is perhaps now on the cusp of that tie that has bonded Sirius an XM together being broken. With XM's announcement yesterday regarding lowering of guidance, and Sirius' subsequent announcement reaffirming their recently raised guidance, there seems to be a fervor of activity with these equities. The question is whether this separation activity will continue. Analyst Robert Peck of Bear Stearns downgraded XM stock to two levels to "Underperform" from "Outperform." A substantial downgrade to say the least. Peck feels that XM Satellite Radios management's credibility is in doubt after cutting its growth forecast Wednesday and failing to follow through on marketing promises. We at SSG stated yesterday that the already tarnished management lost further credibility when they reiterated subscriber guidance of over 9,000,000 only three weeks ago, only to shave 500,000 off yesterday. XM said soft retail sales of satellite radios and problems with product availability pushed it to lower its full-year subscriber forecast. XM's comments were taken by the market as an overall sector issue. Sirius responded by stating that they have seen strong sales. Peck also stated, "We think the market has lost faith, and unfortunately what used to be XM's premium over Sirius (confidence in its management) has eroded." Peck said he's optimistic about the satellite-radio industry long term and that shares of Sirius may begin trading more independently of its rival. Merrill Lynch analyst Laraine Mancini said Sirius' price drop has been due to bad news for XM, not for Sirius. After Sirius reaffirmed its growth guidance for this year Wednesday, Mancini maintained a "Buy" rating and $9 price target. "Investors must separate XM news flow from SIRI fundamentals, which should be easier to do as SIRI continues to meet its milestones while XM works to eliminate overhangs," Mancini wrote in a research note. On the contrary side, Banc of America analyst Jonathan Jacoby still prefers XM over Sirius. Many people who follow this sector have questioned Jacoby's recommendations in the past. In earlier reports Jacoby has always felt that XM should have a larger market cap than Sirius. It would appear that he does not see the separation that other analysts recognize. He states that he feels that XM will have more valuable subscribers, but we here at SSG disagree with that assertion. Sirius has always maintained a higher ARPU than XM, and even with fewer subscribers is garnering more advertising revenue than XM. Jacoby did lower his target on XM from $30 to $25, and maintained a BUY for XM. It would appear that most analysts are starting to see a separation. With Sirius maintaining guidance, they are now on track to add more subscribers in 2006 than XM. Further, Sirius is on track to reach Cash Flow Break well ahead of XM with all expenses accounted for. The financial metrics is something you will see many analysts referring to in the coming weeks. All things considered, both equities may well be very oversold, and near bottoms. It will be interesting to see the trading patterns develop over the coming months. Merrill Lynch has issued a report on Sirius Satellite Radio in which they maintain a BUY rating. The report points out that Sirius has been negatively impacted by XM Satellite Radios bad news, and that XM's situation has impacted the sector. "In our opinion Sirius' fundementals remain intact andthe recent declines are overdone"
"In our opinion, recent SIRI price declines were driven by Non Sirius Related and Non Fundemental that are largely isolated to XMSR...."
Comp USA, a retailer that advertised the Pioneer Inno from XM Satellite Radio published this notice that shipments of the product have been delayed. Whether or not the delay relates to manufacturing, distribution, or the RIAA suit is not known at this juncture. A few calls to Best Buys showed no Innos in stock, but Crutchfield appears to have some, so it may be as simple as a distribution issue to Comp USA. Jim Cramer often mentions Sirius Satellite Radio on his show, and of late has not been very positive on the company. His boistrous comments oft become fodder for the message boards. 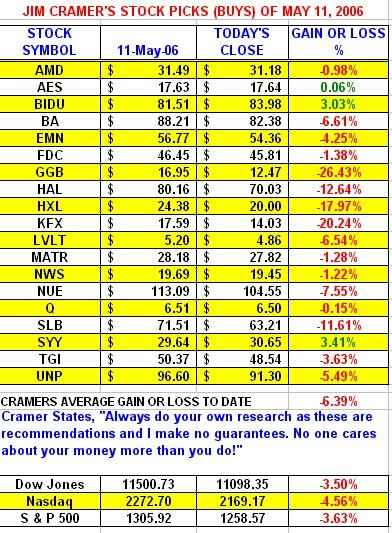 SSG decided to follow some Cramer picjks to see how well he performs. So far, while his show performance is entertaining, his stock picks of May 11, 2006 have left a lot to be desired. On May 11 Cramer outlined 19 stocks that he felt were "BUYS". To date, 16 of them are in negative territory, and 2 of them are off by over 20%. The chart (click to enlarge) outlines Cramers performance through May 24, as well as the major indexes. 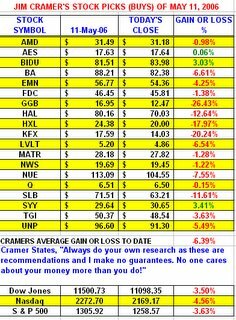 There has not been a day yet where Cramer has beat the indexes, and investors that followed his May 11 advice would now be down 6.39%. ST Microelectronics (symbol STM) was upgraded from "underperform" to "market perform" by piper Jaffray today. Those that follow satellite radio, and in particular Sirius should keep ST Microelectronics on their radar screen. St Micro is a supplier of antennas for popular Sirius satellite radio receivers such as the Sportster and the S50. While the immediate aftermath of XM lowering subscriber guidance was felt deeply in the sector, there is a potential silver lining. 1. XM likely lowered guidance to a target that is easily obtainable, and likely to be exceeded. At the point they lowered guidance, the impact would be the same if the figure was 300,000 or the number they used at 500,000. 2. This lower guidance takes pressure off of XM to spend heavily to meet expectations. There will be no need to scramble to get subs at any cost simply to hit a lofty expectation. This will help XM as well as the sector as a whole. This will ensure that XM can spend their money more judiciously, and in turn Sirius can as well. 3. Although the year over year growth for Sirius has been very strong, the same indication can not be made for XM. This is because they are at differing points in their growth cycle. There will come a point when the year over year numbers will not be as impressive as in the past. This is not saying that satellite radio will not grow, it is mere acknowledging that impressive year over year numbers in terms of subscribers will at some point level off. It is at this point where impressive year over year financial metrics become the focal point. As a sector, or individually, it is important that impressive year over year financial metrics be delivered. 4. It was not really proper for XM to state that their subscriber growth issue is a sector wide problem. Sirius obviously took exception to XM's statement and rightfuly so. The immediate impact of the news took down both equities. Sirius recovered in after hours by releasing a statement reaffirming all of their guidance. 5. It is frustrating that only three weeks ago XM specifically maintained subscriber guidance at 9,000,000 by the end of the year. In our opinion it is very likely that XM had good indication at that point that they were not going to hit 9,000,000. Credibility is something that XM needs at this point, and this announcement takes away from that. One begins to wonder if the debt placement activity came into play with not announcing something a few weeks back. XM is now at attainable targets, but the credibility issue needs to be addressed. While the immediate impact was not pretty, the "bar" is now set lower for XM, and it is likely lower by a safe margin. This may put some ease on the coffers of both XM and Sirius. In a duopoly that is competing for subscribers, the "other company" is usually forced to match that which their competitor is doing in terms of pricing. Sirius got a free pass from that with Stern, but that pass will not last forever, and at some point the pricing structure has to remain competitive. As we stated in previous articles, this has the potential to be the issue that puts some separation between these two companies. With current prices where they are, you can be sure that investors are making every conceivable comparison between XM and Sirius prior to investing. NEW YORK, May 24, 2006 /PRNewswire-FirstCall via COMTEX News Network/ -- SIRIUS Satellite Radio (Nasdaq: SIRI) today reaffirmed its guidance of more than 6.2 million subscribers by year-end 2006, representing an 87% increase over the company's subscriber base at the end of 2005. The company continues to expect to add more than 2.8 million net subscribers during the year. "We continue to experience dramatic growth and strong demand for our service across our retail and automotive OEM channels," said Mel Karmazin, CEO of SIRIUS. "This supports our expectation that we will capture the majority of retail satellite radio net additions in 2006." According to The NPD Group*, SIRIUS achieved 54% retail market share in April 2006, compared to 38% retail market share in April 2005. For 2006 year-to-date, SIRIUS has achieved 58% retail market share, compared to 40% retail market share through April 2005. Also according to The NPD Group*, SIRIUS achieved 55% year-over-year retail unit growth in April 2006 and a 120% increase year-to-date. SIRIUS' first quarter of positive free cash flow, after capital expenditures, could be reached as early as the fourth quarter of 2006, and the company continues to expect to generate positive free cash flow for the full- year 2007.
from Wal-Mart, Clubs, and direct sales." Satellite Standard Group is keeping you up to speed. A SETTLEMENT HAS BEEN REACHED IN THE CBS RADIO VS. HOWARD STERN SUIT. A settlement has been reached in CBS Radio's breach of contract lawsuit against radio host Howard Stern, an official in a court clerk's office in New York said on Wednesday, but both sides said no agreement had been signed. "The only response we're authorized to give you is the settlement agreement is not yet signed. We will release a statement when it is," said the office of Peter Parcher, lawyer for Stern. "CBS says a settlement agreement has not been signed. When it is signed, we will make an announcement," a spokesman said. CBS Corp. (CBSa.N: Quote, Profile, Research) had filed suit accusing the raunchy radio star of improperly using his final months at CBS Radio to promote Sirius Satellite Radio Inc. (SIRI.O: Quote, Profile, Research), with whom he had signed a five-year deal valued at $500 million. 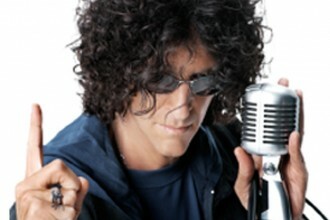 The "Stern Effect" is an oft discussed subject that centers around whether or not Howard Stern will bring subscribers to Sirius Satellite Radio. Many people have recently cited that the "Stern Effect" was beginning to wear off by pointing to slight declines in NPD percentages since January when Stern launched. Those declines were fully expected. The launch month would by nature bring a huge influx of initial followers. Before today, we here at SSG had felt that Phase Two of the "Stern Effect" would commence when on-line listening becomes available in June of this year. The ability for Stern fans to listen on line has the potential to bring on another wave of subscribers to Sirius satellite Radio. While this second wave would not be as big as the first, it would likely be very noticeable. We now title the on-line listening capability phase 3. Phase 2 happened today. XM satellite radio, citing weaker than expected retail sales lowered their 2006 subscriber guidance from 9,000,000 to 8500,000. A reduction of half a million subs. Combine that with Sirius raising guidance from 6,000,000 to 6,200,000 and you get a 700,000 subscriber swing. VERY SUBSTANTIAL. What caused this swing? The product offerings are still the same as three weeks ago for Sirius, meanwhile XM has launched their new MP3 capable line. At this moment XM has the newest hardware selection on the shelve. The price of the services remains identical as well. Has there been a dramatic shift in consumer demand? Yes there has. Did Howard Stern influence that shift? Most likely he is the biggest factor involved. What we see here with this latest guidance shift is a confirmation of "The Stern Effect". It will be very interesting to watch what happens with on-line listening capability. Satellite Standard Group has several articles about Howard Stern, including the original "Stern Effect" article. Also look for interviews with personalities such as Maryanne From Brooklyn, Brent and Manson from the Bubba the Love Sponge Show, and other intersting aspects that relate to Stern as well as Sirius. Check out the whole site HERE, and feel free to explore. Despite the assertion by XM Satellite Radio's Hugh Panero that slow subscriber growth is a sector issue, Sirius Satellite Radio reiterated their guidance (which they raised 3 weeks ago by 200,000 subscribers) of 6,200,000 by the end of 2006. David Frear of Sirius satellite Radio reiterated Sirius' guidance at the Morgan Stanley conference today. He further stated that the issues that XM is facing are XM's issues and not Sirius', and that Sirius remained on target for their goals. XM pointed out a slowing retail channel as a contributing factor to the lowering of their guidance from 9,000,0000 to 8,500,000. It would appear that Sirius disagrees about a slowing retail channel, and the data seems to back up what Sirius is saying. According to NPD, the retail channel has seen growth of 66% through April 30, 2006 over the same period from a year ago. Sirius has seen 96% of that year over year NPD retail growth, while XM's growth sits at 4%. Satellite radio is indeed growing. The question is which satellite radio company is seeing the most benefits from the growth. One third of the way through the year, the retail channel has been dominated by Sirius. SIRIUS SHOULD REITERATE THEIR COMMENTS ABOUT GROWTH AT THE MORGAN STANLEY CONFERENCE IN A PRESS RELEASE. There is no doubt that the sector as a whole has taken a beating so far in 2006. Today's events give Sirius a chance to truly separate themselves from issues that are impacting their competitor. For the first time Sirius satellite Radio has guidance that is above that of XM. Many in the market have perceived XM as the sector leader, but can that "title" be held when Sirius is projecting over 300,000 more subscribers for 2006 than XM? Is this a point where investors in the sector look at Sirius as a potential sector leader? Looking at the subscriber guidance, and the Cash Flow Break even projections it may begin to turn in that direction. Those that have always believed that Sirius did not deserve a higher market cap than XM, may well begin to reconsider that opinion. Within the last three weeks there has been a 700,000 subscriber swing in subscriber numbers. Sirius raised by 200,000 and XM has lowered by 500,000. This is substantial, and investors should consider this very closely. Satellite Standard Group keeps you informed. Today XM Satellite Radio lowered 2006 subscriber guidance from 9,000,000 to 8,500,000. "Although XM has regained retail market share since the first of the year, the satellite radio category has seen an overall softness at retail during the second quarter to date, and we have been later than anticipated with broad availability of our new products," XM chief executive Hugh Panero said in a statement. Panero's citing of gaining retail share is partially correct. Retail share favored Sirius greatly in January when Howard Stern launched. By nature, the effect of Stern would wane to a certain extent following the launch. Through April this year, Sirius has garnered 59% of the NPD retail share, and this is likely something that XM was not anticipating. Sirius raised their subscriber guidance from 6,000,000 to 6,200,000 a few weeks ago. Now XM has lowered guidance from 9,000,000 to 8,500,000. Should these companies reach their goals, it would mean that Sirius would have an overall market share of 42% at the close of 2006. Sirius currently has an overall market share of about 38.5%. As things now sit, XM is projecting NET additions of 2,567,195 subscribers in 2006. A figure below last years pace of 2,700,000. By contrast Sirius is projecting NET additions of 2,883,440 this year. A figure well above the 2,200,000 that Sirius added last year. Sirius and XM have tended to trade in concert with each other. Does this latest information show a seperation? Only time will tell. Clearly, the secor is growing, but it would appear that Sirius is the company gaing more of the growth.